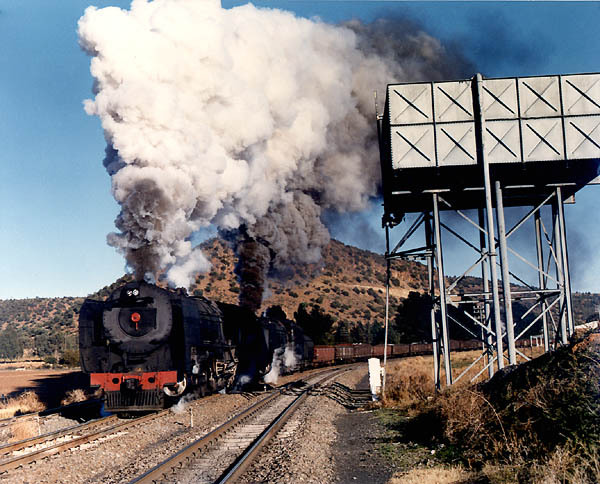 A pair of South African Railway Class 25NC 4-8-4's are doubleheading a freight headed from Kimberly to Bloemfontaine in the the Orange Free State, of South Africa. They have just met another train, and are departing Kloofiend a station about 30 miles from Bloemfontaine. Our morning visit in July 1984, resulted in about 6 trains within 90 minutes all steam!